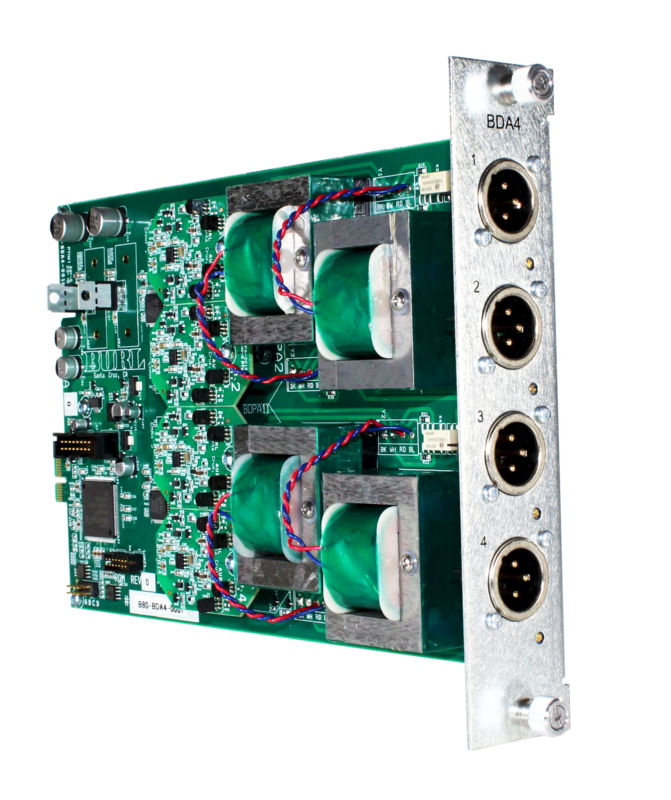 The BDA4, transformer coupled, 4-channel digital-to-analog converter Daughter Card for the B80 and B16 MOTHERSHIP is the result of over 25 years of R&D experience in pro audio digital and analog design. Following on the success of the B2 BOMBER DAC and the BDA8 for the MOTHERSHIP, the BDA4 utilizes the newly developed BOPA14 with BURL Audio’s NextGen Analog. The BOPA14 is followed by the renowned BX5 output transformer used in the B32 VANCOUVER MIX BUS. Couple the BOPA14 with the BX5 and you have sound that is truly HUGE! Kick, Snare, Bass, Guitar, Vocals, Mix… you name it, it will sound bigger, better and more pleasing. For years, engineers have taken their fully digital projects and run them through a 2-track analog tape machine to make them sound “less digital”. The BDA4 with the BX5 output transformer routed to a BAD8 or BAD4 with the BX1 input transformer does something very similar, but better, in that there is no tape hiss and there is higher dynamic range and more headroom. 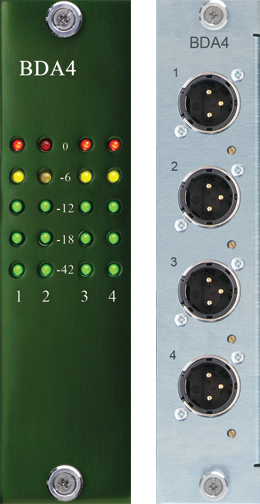 On the digital side, the BDA4 employs a couple of new features; a switchable DAC filter and AVID delay matching. Switching the DAC filter allows you to change the tone from the classic BURL sound to a more aggressive tone with a more forward mid-range. The AVID delay matching allows you to perfectly match the output delay of an AVID IO which is crucial for hardware inserts. If you already own a B80 MOTHERSHIP or if you are buying a new B16 or B80 MOTHERSHIP, the BDA4 is awesome by itself or as a compliment to the super clear BDA8. Adding even just one BDA4 to your MOTHERSHIP will be a big step up. The BDA4 is truly BURLY.